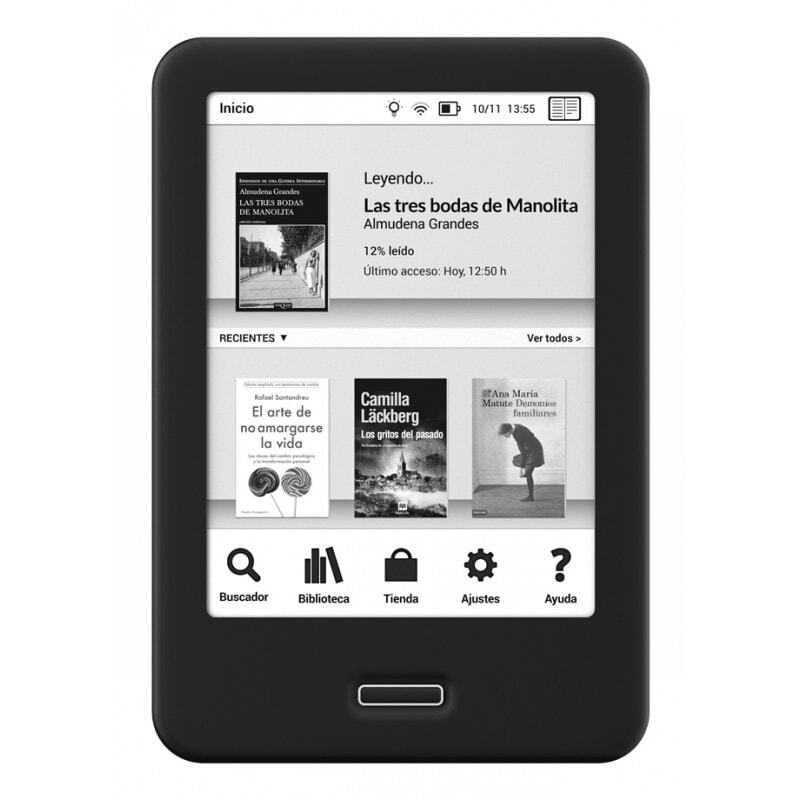 A reader has tipped me to the news that Booq, the Spanish ereader importer, is now promoting one of its ereaders as an open-source device. Booq has been selling ereaders bearing the Cervantes name since at least 2010, but the latest model is a little different. This 6" ereader has relatively unimpressive specs for its 140 euro price, but it does have one feature which could set it apart. Booq says that they have released its code under a GPL license, making the software easy to modify should the Cervantes fall into the right hands. Update: Or at least it would be easy to modify if the Cervantes were in stock. According to the store page (which I didn't think to check before) this device is not in stock. The Cervantes boasts a 6" Pearl HD E-ink screen with a frontlight, IR touchscreen, and Wifi. It runs a version of Linux on a 1GHz CPU with 512MB RAM, and 8GB internal storage. Weighing in at 195 grams, the Cervantes measures 8.5mm thick and packs in a 1.5Ah battery. There is also a microSD card slot for additional storage, but no audio. If you’re an advanced user and you’ve installed the developers’ version of the bq Cervantes’ firmware, you can modify the interface yourself. We’ve published the source code for our software under a GPL*, and you can find out all the details on this website. Hacking ereaders to add additional features is a pastime that dates back to at least the first Sony Reader, and some of the more popular ereaders have their own dedicated hacker fanbases (Kobo, especially), so the idea of adding 3rd-party code to a commercially released ereader isn't new. But I can't recall any ereader being pitched as an open-source device. Is that unusual, in your experience? Update: Apparently my memory is not as good as it used to be. A reader reminded me that back when Irex made ereaders, they released the source code. Thanks, Gertjan! I don’t think the company is called Booq. They are bq. The Cervantes has its code hosted at https://github.com/bq/cervantes, and is sought after by many FOSS folks, which is a bummer because it has been out of stock for a long time. bq is notable for also making a smartphone that runs Ubuntu. Booq is the older name, yes. I still use it out of reflex. And thanks for letting me know how long it was out of stock. It’s too bad that I found out about it so late. Nice move, although I wouldn’t be surprised, if it were poorly exercised. This starts with unavailability of the device and may expand to sparingly documented code. And the footnote on the web site also already reads: “The published source code does not include any program or functionality that requires an external, non-bq licence.” Also, a label “open-source device” would be misleading, because that would suggest an open-source hardware (OSHW) device (https://en.wikipedia.org/wiki/Open-source_hardware and , which this one is not. You might call it a (partial) FOSS reader, i. e., one that uses (some) free and open source software. Back in the days, iRex Technologies open sourced pretty much everything for the DR1000 and DR800 readers. It even came with a full SDK with emulator and development tools. The only parts missing was for licensing reaons, like the reading app containing Adobe RMSDK. As far as I know, the software being largely open source was not advertised, at least not to consumers. It was intended to draw B2B customers. You’re right, it was open. It’s been so long since Irex made ereaders that I had completely forgotten about them. BeBook/Hanlin and Pocketbook Open Sourced a lot of their code. but did they open source more than they were legally required to? All these devices run on one form of Linux or another, and that means that they all _had_ to release some code. Well, pocketbook released an SDK. And Hanlin released the data for the boot loader so alternate firmwares could be loaded. The hardware was plenty open. And that was all that mattered. The device seems to be in stock at this moment.